by by Matt Tuthill, C.P.T. Don’t just participate in your summer league—dominate it! To build a power home run swing, Dana Cavalea, head strength coach for the New York Yankees, recommends adding this move to your workouts. 1) Keep your head square with your shoulders. 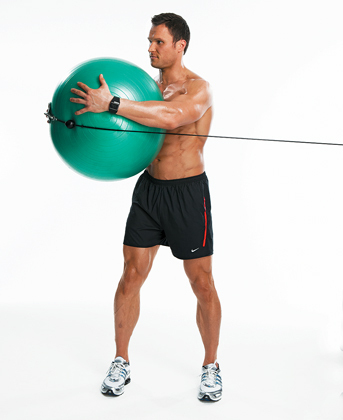 2) Clench the ball in between your hands while holding the cable handle. Manipulating the weight and rep speed can vary your results. Using a heavy weight with slow reps can improve your stability in the batter’s box, while a lighter weight and explosive reps develop bat speed. Alternate slow and fast sets to score both benefits. ● Perform one set of each before resting. 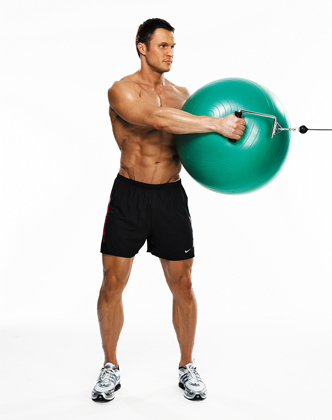 You should use a ball that has a maximum diameter of 65 centimeters for this move. Anything larger is too unwieldy.